We can fight childhood obesity. In the US, childhood obesity rates have quadrupled. Childhood obesity alone is estimated to cost an annual $14 billion in direct health expense in the US. We can help our kids develop mindful eating habits so they stay connected with their bodies. 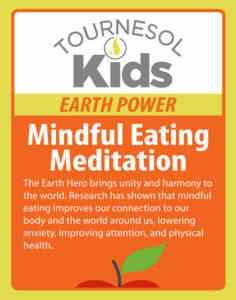 One of the activities in the Tournesol Kids Game is a Mindful Eating Meditation to help teach kids this skill.